To capture the video, audio, and screenshots how you want them, we built settings for keyboard shortcuts, background recording, video encoding, and more. This article describes the settings available through the Xbox app and Game bar. 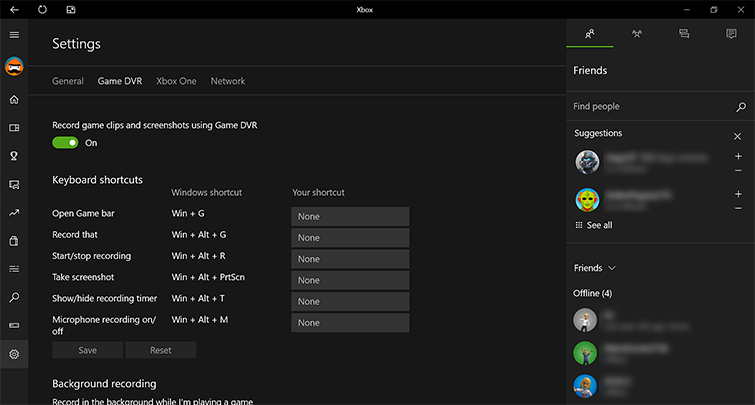 There are standard shortcuts for Game DVR on Windows 10, and you can also set your own preferences. When you set your own shortcut, the standard shortcut will still work. Open Game bar opens the Game bar while you’re playing your game. Record that saves the last few moments of gameplay as a video capture, if you have Background recording turned on. Start/stop recording begins a video capture, or ends one that’s already recording. Take screenshot takes a screenshot. Show/hide recording timer shows you the length of the current recording, or hides it to avoid distraction. Microphone recording on/off helps you record audio through your microphone, so you can add commentary to your video. To set your own shortcut, select the Your shortcut field, and press the keys you want to use for that function. Shortcuts must include at least one of Control (Ctrl), Shift, or Alt plus at least one other key press. If you press keys that are already assigned to a common function, like Control + C for copy, they won’t appear in the field. To remove one of your shortcuts, select the cancel icon next to the shortcut. Select Save at the end of the Keyboard shortcuts section to save your shortcuts. To see or change your keyboard shortcuts in Game bar, open Game bar, then Settings, then select the Shortcuts tab. Go to Game DVR settings in Game bar. Background recording is for when awesome things happen and you wish you had been recording. When you turn it on (it’s off by default), it monitors the last few moments of gameplay so you can capture the moment before it’s gone forever. Background recording can affect your game’s performance, because it uses some of your PC’s resources to record the game in the background. How long the clip will be, using Record the last [time period]. Select the time period to see the options available. Whether Background recording will run while you’re using battery power, because it uses more power than regular recording. Whether Background recording will run while you’re using a wireless display, because it does use GPU resources. 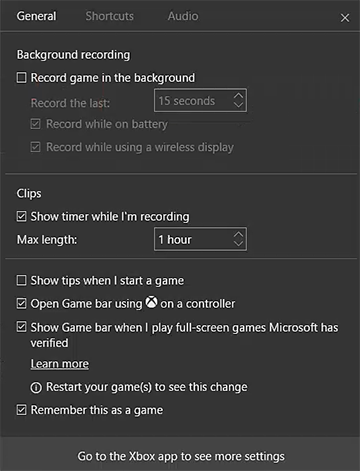 To see or change your Background recording settings in Game bar, open Game bar. You’ll find Background recording on the General tab. Go to Game DVR settings in Game bar. Set the maximum recording time for a clip so that it saves automatically when it reaches that length. Select the time period to see the available options. To change your maximum recording time in Game bar, open Game bar. You’ll find Clips on the General tab. Go to Game DVR settings in Game bar. Saving captures shows you the folder your screenshots and game clips are saved to. To see those files, select Open folder. Audio lets you record with or without sounds from your game and your microphone, and lets you choose the audio quality. 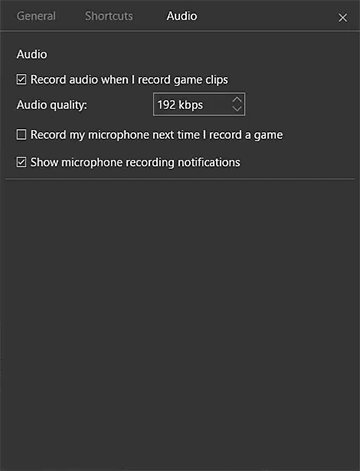 To record game sounds with your game clips, turn on Record audio when I record game clips. To choose a different audio quality than the default, select the option next to Audio quality. To record your comments through your microphone, turn on Record my microphone when I record game clips. Note To change your audio settings in Game bar, open Game bar. You’ll find all audio settings on the Audio tab. Go to Game DVR settings in Game bar. Video encoding lets you select the video quality and resolution. Video quality controls both frames per second (fps) and bit rate (mbps, or megabits per second). By default, game clip quality will be 10 mbps at 1080p and 4.5 mbps at 720p, and a frame rate of 30 fps. Select the Video quality options to choose among Standard (30 fps, lower bit rate), High (30 fps, higher bit rate), or Very high (60 fps, higher bit rate). Recording at 60 fps is available only on Windows 10 Anniversary Edition. Higher quality and resolution generally requires the PC to work harder, which may decrease performance. Very high is only recommended for powerful gaming machines. You can determine the best settings for your system by trying them out. The maximum video resolution is the game resolution, up to 1080p. Game clips will be recorded at the resolution specified in the game, up to 1080p. For games played at a higher resolution, game clips will be scaled down to the selected level. To open settings in Game bar, press the Windows logo key + G, then select Settings. 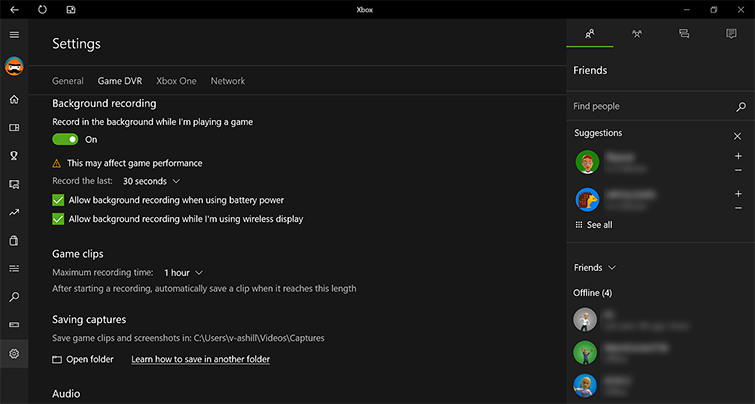 Game bar has some settings that you’ll also see in the Xbox app settings. Setting it in either location will affect the settings in the other. On the Settings screen, there are three tabs: General, Shortcuts, and Audio. 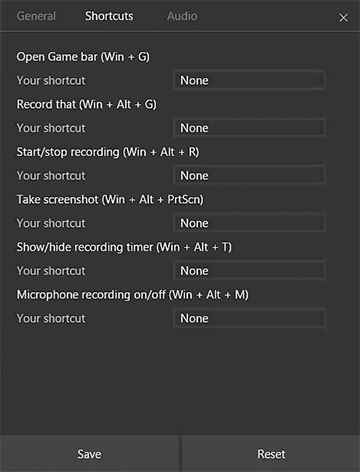 Background recording settings in Game bar are the same as the settings that appear in the Xbox app, described earlier. Go to Background recording for info. 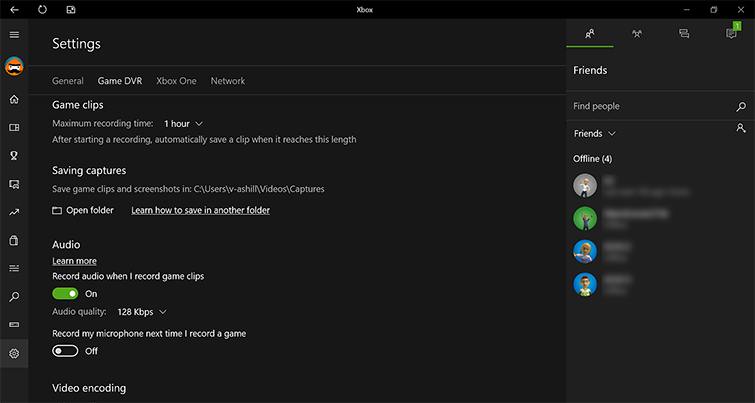 The Clips setting in Game bar is the same as the Game clips setting that appears in the Xbox app, described earlier. Go to Game clips for info. Select Show tips when I start a game to learn more about using Game bar each time you start it. Select Open Game bar using on a controller if you want quick, one-button access to Game bar from your Xbox One controller. Select Show Game bar when I play full-screen games Microsoft has verified if you want Game bar to appear over your full-screen game while you play it. Select Remember this as a game if you want Game bar to keep recognizing that the program you opened it with is a game that can be recorded using Game bar. Shortcuts in Game bar are the same as the Keyboard shortcut settings that appear in the Xbox app, described earlier. Go to Keyboard shortcuts for info. Audio settings in Game bar are the same as the Audio settings that appear in the Xbox app, described earlier. Go to Audio for info. Would you like to contact Support regarding the "Adjust Game DVR settings on Windows 10" issue you were reading about or a different issue?